How can the tiny plankton in the sea just off Western Europe be affected by changes 6000 km away on the other side of the North Atlantic Ocean? How can a slight rise in the temperature of the surface of the Pacific Ocean have a devastating impact on amphibian life in Costa Rica? Living populations across the globe are connected by great swayings of the world's atmosphere and oceans, the largest of which is El Nino. For almost half a century, the numbers of some of the smallest animals in the North Sea have gone up and down as the Gulf Stream has moved north and south 4000 miles away at the coast of the USA. This connection has happened because the weather patterns over the North Atlantic are intertwined by a phenomenon first described by a Danish missionary in the eighteenth century, the North Atlantic Oscillation. 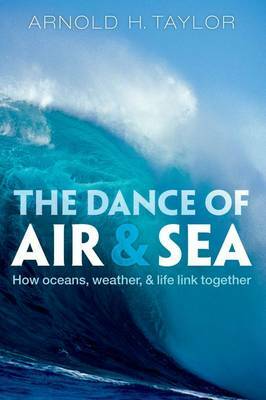 In The Dance of Air and Sea Arnold Taylor focuses on the large-scale dynamics of the world's climate, looking at how the atmosphere and oceans interact, and the ways in which ecosystems in water and on land respond to changes in weather. He tells stories of how discoveries were made, and the scientists who made them; and he considers the crucial issues of how the discoveries aid our response to global warming.